Shipping: Any freight shipping estimate (including "Free shipping") is to a commercial address with a loading dock or forklift. Lift-gate Delivery or Home Delivery with Lift-gate service is available for an additional fee. If you need Lift-gate Service or Home Delivery Service please contact us. For any questions or assistance with shipping, please call 1-888-291-4615. 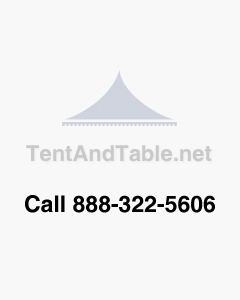 Contact Us: Party Tents Direct is a distributor of commercial grade tents, tables, chairs and more. Our mission is to provide high quality, safe products for your party rental business. If you need any additional information, do not hesitate to call us at 1-888-291-4615. You can also contact us at [email protected]. Our knowledgeable representatives are here to help you put together package deals, assist with you shipping, or to answer any questions you may have.